What is the difference between HTC Club Memberships and HTC Clinics? We offer both our Club program and Clinics each season. The main difference is the number of hours of instruction that you will receive! Full Season Membership – 12 Practices, 24 hours of instruction during the current season. Half Season Membership – 6 Practices, 12 hours of instruction during the current season. Club Members are also required to purchase a practice pinney and their uniform. Our Clinics – Each clinic is for one hour and will run for 8 weeks. Clinic players will receive 8 hours of instruction. Both Club Members and Clinic Players can compete in our Tournaments. To sign up for a tournament, players can click on the Tournament tab and sign up. The fee for our local tournaments is $50. We will assign players to a team for each tournament. 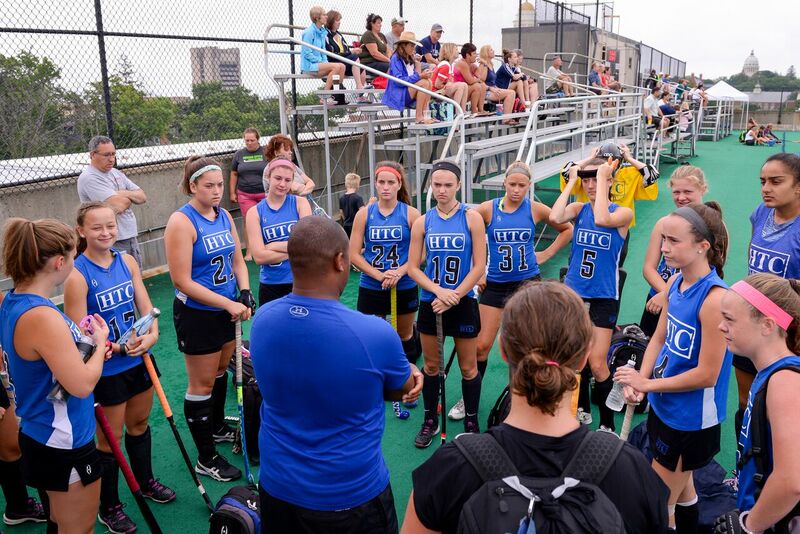 Being a new member of HTC field hockey club, do I have to attend the required evaluation session? Yes, all new players to our club are required to attend the scheduled evaluation session. At this evaluation session, we will evaluate player’s current ability levels. This will help us to design the player’s curriculum plan for the season. Is there a fee to attend the evaluation session? Yes there is a small fee to attend the evaluation session. The fee is $50. If I am a new member of the club, do I sign up for the evaluation session and my membership at the same time? Yes, you can sign up for both now. By signing up for your membership asap, you will secure your spot at that location. We will have a set limit of players at each site to ensure quality practices. What if I cannot make my site’s evaluation session? Players can sign up and attend another site to be evaluated. If a player cannot make any of the evaluation sessions we ask them to do the following; sign up for the evaluation session online anyway to be fair to those that are able to attend, and have a coach email a simple recommendation to dbrickey@HTCfieldhockey.com. Players can sign up for the evaluation session and their membership at the same time. In our Winter Season, HTC offers both outdoor hockey and indoor hockey practice sessions, what is the difference? There are two types of field hockey that is played in our country; the traditional outdoor game, and indoor field hockey. Our main field hockey club will be teaching the outdoor game and skills on field turf. We will also offer sessions for players that are interested in learning and playing the indoor hockey game. The indoor hockey game is played on a smooth surface, has side boards that the ball can be played off of, and requires a lighter indoor field hockey stick. The United States has both an outdoor and indoor National Team. These are two completely different games. For players that are interested in signing up for the indoor hockey sessions, you can find that information under the club tab as well, under the heading; HTC Indoor Season. Can I sign up for both an Outdoor Hockey and Indoor Hockey membership? Yes of course! You can sign up for both memberships on the HTC website. You mentioned Outdoor Hockey, are these practice played outside in the winter? NO! When we say Outdoor Hockey that means we will be teaching the skills that are used in the traditional outdoor game. We will be inside for all of our winter practices. How do I sign up for my membership? You can click on the big blue register now button to sign up. It will take you to our registration site where you can select your membership type. Depending on what membership type you select, your membership includes either 3 seasons of practice (Year Membership), 12 practices (Season Membership), or 6 practices of your choosing (Half Season Membership). Can I sign up for two or more locations? Yes, you can sign up for as many practices that fit your schedule? Do I have to purchase the required HTC Uniform Kit? Yes, all members of our club are required to purchase the uniform kit for field players or for Goalkeepers. The uniform kit for field players also includes the practice pinney that is needed for practices. How do I purchase the required HTC Uniform Kit? Players can purchase the required uniform and practice pinney by selecting the STORE tab on the HTC website. You will be able to choose your uniform type, sizes, uniform number, and more. There will be a required section, a recommended section, and a spirit wear section with all types of HTC gear. Once you order your gear, it will be shipped directly to your home. We will have several tournaments per season posted under the tournament tab. Players can sign up for any tournament that fits their schedule. Players can sign up for all of the tournaments, or none of the tournaments, it is completely up to your desire to compete and what works with the family’s schedule. The fee per tournament varies from $50 (Local Tournaments) to $525 (National Showcases). We will combine players from all of our sites to compete in tournaments. Registration for tournaments will close one week prior, so sign up early so we can take the appropriate number of teams! How will I know if a practice/tournament is cancelled due to bad weather? We will notify players and families of any cancellations two hours prior to the start time. We will notify by posting in the announcement section of the website, via social media, and by sending an email. Can I be placed on a team for a tournament with my middle school or high school teammates? Yes, we will group players from the same school together as much as possible. Will cancelled practices due to bad weather be re-scheduled? No, we are unable to re-schedule cancelled practices. Players can make up a cancelled practice by attending one of our other club locations. Players do not have to notify us if they plan to attend another site. Attendance will be taken at each site, so we will have a record of such changes. Can I get a refund or credit for any missed practices? No, practices that are missed for personal reasons will not be credited for another season. All practices in your membership must be attended in the season that was chosen. We are excited to begin this journey with you! Sign up today and take your game to the next level! Contact Deb Brickey (860.304.8042) or Darren Smallhorn (860.778.1278) for more information. Previous Previous post: Hiring Coaches Now! Next Next post: New Uniforms and Pinnies Available!